In our time as curtain manufactures, wholesale curtain track and pole providers we have often been asked to supply and have often supplied traditional poles with rings for bay windows. The problem is they never worked properly. The problem lies with the fact that rings do not like going past brackets. Even C-rings and passing brackets have problems when using them. Also the knuckle joins or flexible corners never work like they should and interfere with the operation of the curtains. When we pull curtains we tend not to stand directly under them and pull them level and straight over the brackets, we tend to reach over a sofa or table and pull them inwards and across the window. This is where most C-rings tilt and start catching the bracket and you find yourself standing on a chair pulling the rings individually past the brackets and around the bends. Finally, after many, many years of research and development we have come up with a solution. A stainless steel pole that can not only be bent to a radius of 30cm forward and reverse but also has a bracket that does not get in the way of the rings. The bracket is designed to screw up through the bottom of the pole and is cut away so that even pulling the curtain at a 45 degree angle will not make the ring hit the bracket. Finally, the pole can also be used in conjunction with eyelet curtains although caution must be taken when buying eye let curtains as there is still no way of eyelets to pass brackets.there is a curtain pole with rings that can work on large straight or bay windows. Available in one piece up to 600cm in length (yes 6 metres wide in one piece) this pole can be bent to suit a bay window perfectly. And there is no need to worry about the fitting and measuring of the pole, we have designed the brackets to be adjustable from 11cm to 14cm to allow for uneven surfaces or small adjustments to window dimensions. The pole itself is a high quality stainless steel 30mm in diameter and can be bent by our trained engineers to bend as a gradual curve semi-circle or at a radius of 30cm for angled bends. We have also selected a range of finials to compliment the pole and its design that range from simple and modern to the more traditional. Finials and midials are decorative accessories that are specially designed to brighten up curtain poles. Finials are designed to be fitted at each end of the pole and midials can be fitted anywhere along your curtain pole. Our range of curtain pole accessories will enable you to add personality to your pole, style and decorate it to match your decor or create an eye catching feature to add sparkle to your home. 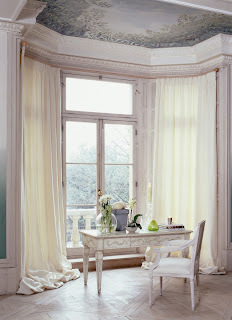 Wrap individuality and creativeness around your window with stylish designs in a wide range of colours. We stock finials and midials for galleria and designer poles and for poles with gliders. Add an elegant touch to your home with our coral glass fluted finials or create a sophisticated look with stylish square crystal finials which feature green and silver stripes. If you are decorating your bedroom, our lilac rounded finials and midials are perfect for adding a feminine touch to your window. Sparkly, beaded designs add glamour and give the pole an ornate finish. Holdbacks are designed to dress your curtain away from the window. They also allow more light into the room and give your window a softer look. Tiebacks, which are made with materials often fade overtime, can easily break with too much use and are prone to fabric pulls. Here at Tracks-Direct we stock high quality wooden, glass and chrome holdbacks which suit many curtain sets and add style to your window. Bamboo disc holdbacks are perfect contemporary features for creating an African feel in your lounge, bedroom or dining area. This quirky design is also available as a midial to accessorise your curtain pole. Add style and personality to your window with our extensive range of finials, midials and holdbacks. When moving into a new home or updating curtain tracks and poles, many people are under the impression that the mechanical devices are too expensive and not worth the hassle of setting up. However, electric curtain tracks are now perfectly affordable and can be an ideal way of adding a touch of luxury and security to your home. 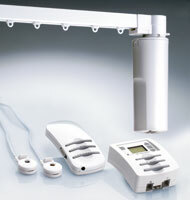 The electric curtain track can be operated in various different ways. The remote control mechanism enables users to open and close their curtains from the comfort of their sofa. Timer and light activated systems can open and close curtains even when you are not home; a great security feature for deterring burglars when you’re on holiday or at a party. 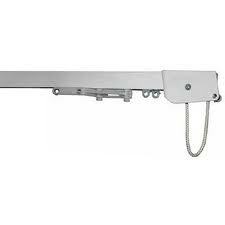 Some curtain track specialists will even supply electric tracks which are operated using integrated radio receivers. These can be conveniently linked to a handset or home entertainment system. Traditional curtain tracks often need to be replaced as the curtains will begin to stick, making opening and closing curtains a difficult task. Many of the luxurious curtain sets on the market today are made of very heavy materials. This can make manual operation unsafe, particularly with the use of a pull cord as these can pose serious health and safety problems, including the risk of strangulation to small children. Electric curtain tracks can also be created for bay windows. It can be very difficult to find a good quality curtain track or pole for a bay window as many home stores do not have the resources or facilities to bend their tracks. However, curtain track specialists will now supply made to measure electric curtain tracks. The manufacturing of bay window curtain tracks is completed using specialist software technology that checks the customer’s measurements, ensuring they are completely accurate. This enables the manufacturer to create an electric track system that fits your bay window perfectly. Electric curtain tracks are great value for money. They are reliable and will last for years on end. They come complete with full warranty and customer support. For luxury and convenience in your home, choose electric curtain tracks. Most of the products on our web site are bespoke made to measure styles of curtain rails that are made, bent and assembled in our own factory. We are manufacturers and suppliers of bespoke curtain poles and curtain tracks and we’re certainly not a middle man. A bent Silent Gliss Metro pole 6130. We are the only manufacturer of bay window curtain poles and tracks to use software technology in order to check a customer’s measurements and plot a full scale diagram for our engineers to use in order to make the particular curtain tracks or poles. The software we use checks customer’s measurements and ensures that the measurements that we have been given are correct. If they are not then we immediately contact the customer and ask for the measurements to be re-checked. This system ensures that no curtain rail is ever bent incorrectly and eliminates human error from the drawing and bending process, giving you peace of mind that nothing will be designed without a 100% guarantee that it is correct. We understand that measuring windows at certain heights and bay windows can be difficult. We can often pin point where customers have made a mistake, and ask for one specific measurement to ensure the curtain rail is bent to the correct dimensions. Electrically operated curtain tracks are designed to open and close your curtains without having to handle the curtains or the need to have cords dangling to the side. Once electric curtain tracks would have been considered frivolous and likely only bought by the extremely well off. Now they are considered to be safer and more secure than the other curtain track options. There is a range of different options that offer different benefits depending on what it is you seek. An electric curtain track can add security to your house by creating the illusion that someone is at home even when they are not. We have had lights that can turn themselves on and off for a long time, now we have curtain tracks that can open and close when you are not at home. An electric curtain track that has a timer and light sensor can be set to close when it gets dark and open when it gets light. The sensitivity of the sensor can be adjusted to take into account the amount of light in the area and to make sure that the curtains do not have to close as soon as a dark cloud comes over or open as soon as the sun is up. The timer can be set to open and close at specific times and will override the sensor. Last year sadly 6 children died after getting caught on curtain and blind cords. Having an electric curtain track eliminates the cords that are found on some curtain track and blind systems. 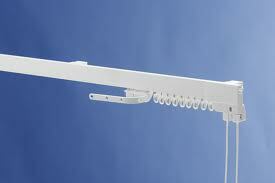 If you have a curtain track or blind with a cord please make sure it is fastened to the wall. If you do not have a way of securing your cords to the wall please contact us and for the price of a stamp we will send you a free cord tidy. When the remote control systems for televisions became available many people thought that they were pointless and to have one would be lazy. Now we all have televisions with remote controls and we would not think of going back to the old way of getting up and changing the channel. Will curtain tracks be the same? They are now available with either just an infra-red remote control or infra-red control and timer with light sensor. We even do electric curtain tracks that operate using integrated radio receivers which can be linked either to a hand set or to an existing home entertainment system. They can even be set to open and close using a web enabled phone. There is a wide selection of electric curtain tracks, all of the electric curtain tracks that we supply can all be bent to suit bay windows. We can now also supply electric curtain poles. Be Careful When Purchasing Electric Tracks – Brand Counts. We understand that as a potential customer, you are always looking for a good deal, but do not be deceived by cheap alternatives. When purchasing an Electric track brand does matter. Silent Gliss is the leading global supplier of motorised and manual curtain and blind systems to the high end market. Their focus is on quality and innovation, something that some of the competitors lack. The best way to know whether a product is a leading brand is to look at what the large department stores and retailers supply. Companies like John Lewis will not supply a product that is problematic and unsupported. For more information please do not hesitate in contacting us. Curtains or Curtain Track/poles – Which should I spend the majority of my budget on? If we were to turn the clock back thirty years we would see a totally different style of furnishings to today. The style of window furnishings that we would see would probably be handmade and would have been made by an experience British curtain manufacturer. They would have been hung on a fairly cheap Harrisson Drape, Swish or Kirsch track which more than likely would have been plastic. In the thirty years since, as well as my hair has changing colour and becoming a little lighter, widow furnishing fashions have changed, and we have seen a switch from people spending the larger part of their budget on the curtains and window dressings to the curtain track or pole that they are hanging them on. When you think of it this makes perfect sense. What is the point of spending £100’s or even £1000’s of pounds on curtains if you are going to be grabbing your curtains by hand and struggling to drag them along a curtain track that cost £20. It makes even more sense when you think that the look of curtain tracks has changed little, yet the style and look of curtains and fabrics has changed several times in this period. corded curtain tracks have become more technical with internal cording channels and improved glider technology, but the look remains reasonably constant. All the improvements are designed to make them work more efficiently and last longer. A quick question for you, which of the tracks below was around in 1980? It is an unfair question because the truth is they both were available in 1980 and they are both available now. That is how little the look of these products has changed. So why spend the majority of your budget on curtains when the fashion could change in a year or two? Well like everything in life you do get what you pay for. A well manufactured handmade curtain using a good quality fabric will dress nicer and look much better than a readymade or express curtain. So back to square one. How do I decide how to spend my budget? If you want to change your curtains and look of the room along with the fashion trends then spend the large portion of your budget on the track or pole. If you want to design a room that you are happy to stay with for many years, then it is a good idea to buy made to measure handmade curtains but make sure you do not scrimp on the track or pole. Ensure that the product bought to hang the curtains on will last as long as the curtains. 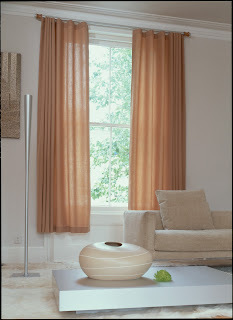 If cost is an issue you may think of buying a good quality made to measure curtain track rather than a pole. Since I manage two companies one that makes handmade curtains and the other that makes made to measure bespoke poles and tracks we are ideally situated to see that the majority of people are now beginning to choose to spend their money on the curtain hanging system rather than the curtains themselves. Looking at the way we live our lives and the continual changing of fashions, I can see the balance tipping further in favour of the quality and design of the hanging system and less on what is to be hung on them. Over the past five years we have seen a large increase in the number of eyelet curtains that we are making. Eyelet curtains are a heading style that involves the pole going through rings that are punched top of the curtain. These are very modern and very attractive but are not totally practical for all situations. The problem with Eyelet curtains is that due to the way the rings fit entirely around the pole it does not allow the Eyelet curtains to go past the brackets. 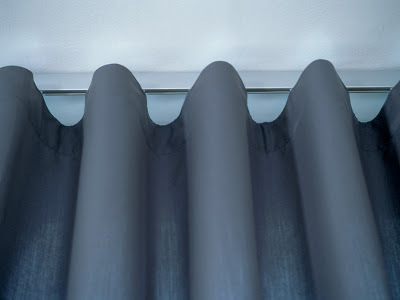 This limits the quantity of brackets that a pole with Eyelet curtains can have to three, if two curtains to the window are required, and only two if one curtain is required. This is okay if the window is a straight and not very wide, but what if your window is a bay window or over 250cm or you want to fit the pole to the ceiling. You would be wrong to think that you are stuck with a traditional curtain heading like the triple pleat or pencil pleat heading (which are now quite dated and are not necessarily suitable for some modern properties). There are other alternatives. 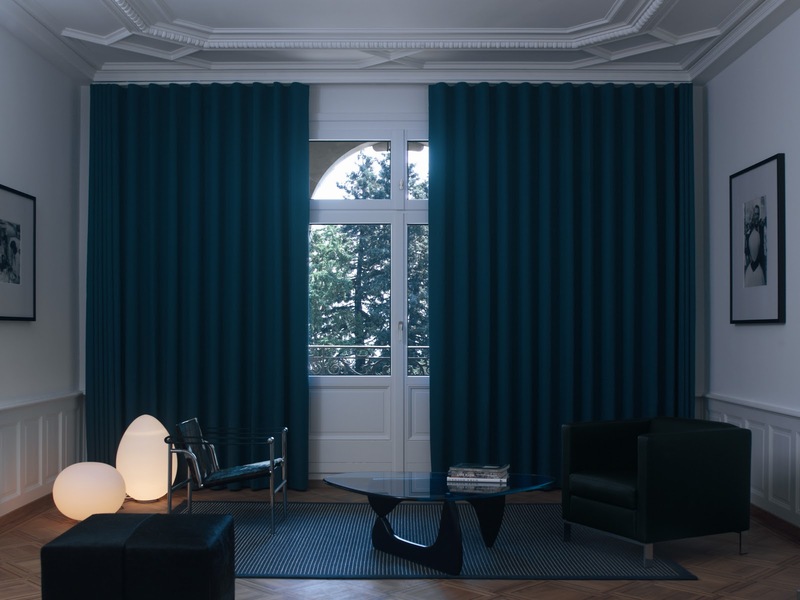 The Wave curtain heading style is a great alternative to Eyelet curtains. The smooth flow of the wave curtain heading looks similar to the smooth flow of an Eyelet curtain, with the added bonus of it being hung from underneath the pole allowing the curtain to be pulled past brackets, around bends and fitted to the ceiling. Combining the wave heading style with the Silent Gliss made to measure poles or tracks will both be practical and stylish. 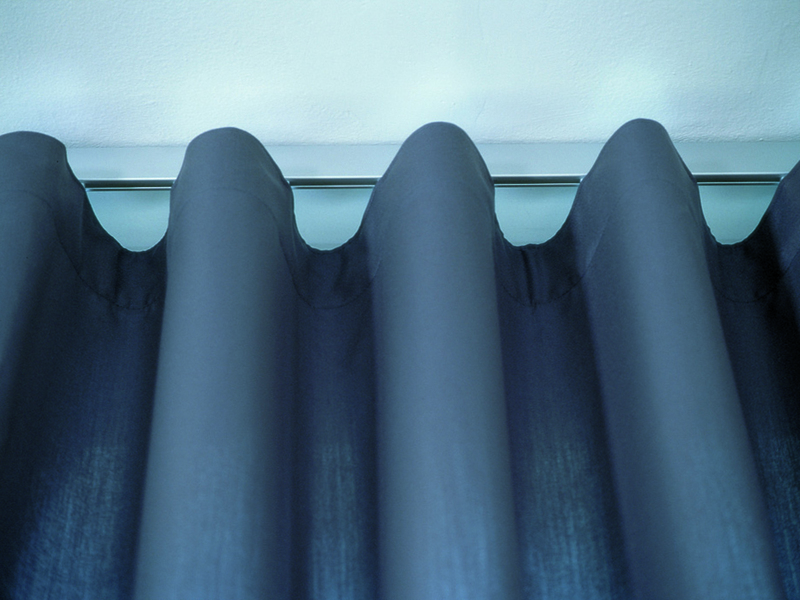 The wave curtain heading is the most revolutionary thing to happen to curtain making in the last 50 years. For more information please do not hesitate in posting a comment or Contacting me directly by e-mail. Wave curtains on an Autoglide Elecctric Track. Wave Curtain Heading on a Metro Flat Track Fitted to the Ceiling. Now that I have got the “don’t buy DIY” thing off my chest I should really start giving guidance on what products are good for your window. If you have a straight window that is 120cm with lightweight curtains (less than 150cm drop) and do not use them very often, then there is nothing wrong with buying a readymade packaged pole or track (I can’t believe I said that). However, how long it will last is another matter. What if your window is larger than this or is a bay? In the UK we have a large proportion of bay windows, what is the solution in these instances? Ideally you will then need a made to measure curtain track or curtain pole. These are products that are made to suit your window be it bay or straight and designed to carry different types of curtains. The recognised leading brand for made to measure curtain tracks and poles is Silent Gliss. Silent Gliss have been established in this country for over 50 years and have become the leading brand of made to measure curtain tracks in the country supplying curtain tracks and accessories to the trade to suit every eventuality. So much so that they are often imitated and you will find a great deal of Silent Gliss copies available from companies that do not have the pedigree or sustainability of Silent Gliss. The Silent Gliss products are all made of aluminium and pass the most stringent quality checks. They do not supply any plastic rubbish of the likes seen in outlets up and down the country. All the Silent Gliss products come with a manufacturers 5 year guarantee and can be seen in high street department stores such as John Lewis. Some of the Silent Gliss products that are available are: Corded curtain tracks, uncorded curtain tracks, corded curtain poles, uncorded curtain poles, electric poles and electric curtain tracks. They do many, many more products which would be far too many to list, if you have a specific requirement then please contact me. Only authorised companies can manufacture Silent Gliss products one of which is Tracks Direct. “But surely made to measure curtain tracks and poles are more expensive” you ask. Yes they are but not as much as you would think especially when you consider the additional use that a quality product will provide. For example a packaged Plastic curtain track at 250cm long retails for around £33.00 you would then most likely have to cut it down to size to suit your window. The Silent Gliss uncorded 1080 curtain track that is aluminium with nylon brackets and gliders is available cut to size and ready to fit for £34.37 on our web site. Why buy a plastic track and do all the work yourself when you can buy a much better product and have it made to size at little extra cost? All the Silent Gliss products are designed so that they can be bent to suit bay windows by a qualified curtain track engineer. These are not products that you can bend at home yourself; they take a qualified curtain track engineer with special tools and machinery to be able to bend them correctly. Tracks-direct have been bending curtain tracks and poles for over 20 years and our qualified engineers are able to offer advice support and help should you require. So for a little extra cost you can buy a curtain track or pole, straight or bent for your window which is made by a qualified curtain track engineer specifically for your window. Why would anyone buy a packaged product? If you would like further information please do not hesitate in Contacting Me or click on the links within this blog for further information. Curtain poles for bay windows can be problematic if you do not invest a little time in research to find a suitable product. The first stumbling block is opting for a cheap DIY product. These can be excellent if you are hanging light weight curtains on a small bay (under 200cm total size) and you have no intention of actually using the curtains. 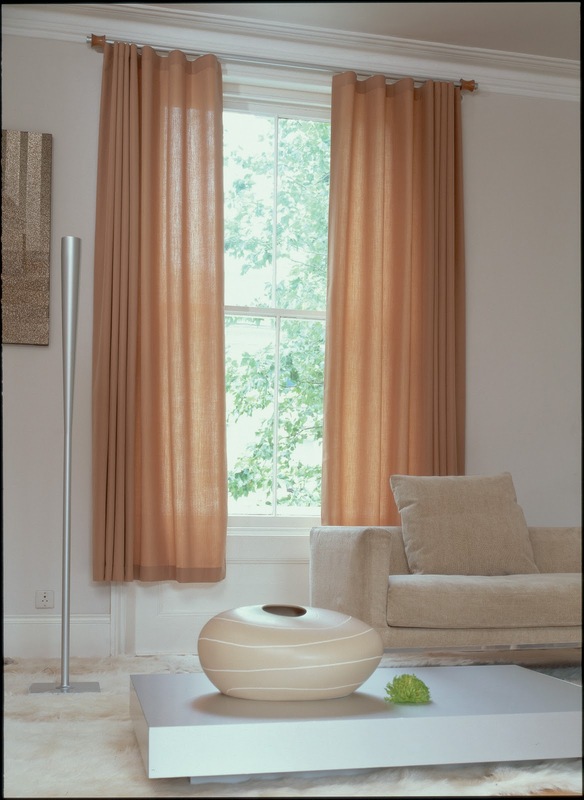 If you have a larger window, long/heavy curtains or want to use the curtains on a regular basis; you really need a bespoke made to measure pole. The second stumbling block is going straight for a traditional style of curtain pole. In my opinion these are not suitable for bay windows. The traditional style of poles with rings cannot go pass the brackets which limits the quantity of brackets that you can fit the pole to the window to three. This is probably not going to be enough as you need to secure the bends to the wall to avoid them from dropping down. If you fit more brackets then you would need to split the curtains into two pairs which means you have curtains hanging in the middle of you bay window. Not the most stylish or attractive option and this also takes light out from the room. There are C-rings and passing brackets available on some brands of traditional poles which work fine as long as you pull the curtain dead straight and make sure that the ring is straight as you pull the curtain. If not the ring tilts and clips the bracket leaving you to lift the curtain past each bracket. I was speaking to a customer yesterday who was interested in a pole for her bay window to replace a pole she had only just bought which operated in the traditional style but with C-rings and passing brackets. She was looking to replace it because “I have to get up on a chair and pass the rings over the brackets one by one” she said. Obviously this type of pole was not suitable and in my opinion had been miss sold. The better option for bay windows is to have a pole with gliders. This type of pole operates like a curtain track but looks like a curtain pole. The pole has a channel in the bottom for the gliders and a channel in the top for the brackets, this way the two do not interfere with each other allowing you to fit as many brackets as you require and still be able to fit a pair of curtains, it can even be fitted flush to a ceiling. The curtain poles with gliders can also be bent by a qualified technician to suit any style of bay window. The smooth bends allows the curtains to pass much more efficiently than the knuckle joints used for most traditional poles. However the most important thing to get when looking at bay window curtain poles is to get good advice and not someone looking for a quick and easy sale.